ECE Prof. Popescu is using properties of light to measure cellular structure and dynamics. Popescu and his research group are developing optical methods for use in the biomedical field. Popescu will be teaching a new course in Modern Light Micrsoscopy that introduces cutting-edge microscopy topics. ECE Assistant Professor Gabriel Popescu doesn’t just want to know how cells communicate--he wants in on the conversation. To accomplish that, Popescu, a researcher in the Beckman Institute, takes advantage of the properties of light through truly original approaches to measuring cellular structure and dynamics. Light scattering techniques, interferometry (bringing two waves together), and microscopy are combined in his research to address tissue interactions and make-up, both for basic science research and for applications. When asked about his research, Popescu says his approach is a form of eavesdropping. For Popescu and the students and postdocs in his lab, their work to quantify the structure and dynamics of cells and tissues has three components: research that serves both basic and translational purposes and that is highly collaborative. 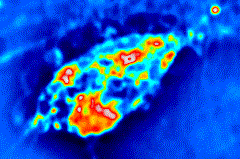 Dynamics of label-free imaging of microglial cell. The group includes students from physics, electrical engineering, and mechanical engineering, with collaborations that touch on topics in fields such as medicine, neuroscience, computer science, and biochemistry. Technology development using their optical methods is central to their efforts, especially for the technology’s potential use in the biomedical field. When asked about their research, Popescu and members of his lab say potential applications of the work are just as important as the science behind those applications. “We’re not only toolmakers but we also use them to do our own science while we hope to impact other research,” Popescu said. “At this stage we are exploring many of the applications of our technology. Huafeng Ding, a postdoctoral researcher in the lab who works on issues such as Fourier transport and light scattering in cells and tissues, says their work seeks results that are useful in real-world settings. Mustafa Mir is a graduate student who has been with the lab for two years. He is working on a blood screening project that uses interferometry to characterize blood cells for medical diagnosis applications. The lab is collaborating on projects with Provena Hospital in Urbana to develop methods for clinical settings. Popescu sees those tools and their approach as offering a new way to understand cellular structure and dynamics. Popescu said that cell growth is a poorly understood phenomenon, but having the proper tools to measure and understand that process could mean a breakthrough. “Then you can modulate them, you can make cells grow differently,” Popescu said. “That’s where we have our own unique place because there are so many physicists and engineering people coming into the field nowadays like us. The fact that we have these ultrasensitive, quantitative methods, I hope, will make an impact in basic science, in research labs, but also we are trying to push it to the clinic, where the requirements are sometimes totally different. That type of end-product vision is a big motivator for the lab’s researchers. ECE graduate student Zhuo Wang came to the group as an electrical engineering student with little background in biology. Ru Wang’s major is in mechanical engineering but in the lab she is developing methods for understanding the mechanics of cells. In one project, she uses microscopy to study the deformation of red blood cells (an important issue for understanding cellular oxygen transport), while another is aimed at developing a low-coherence optical spectroscopy method for extremely fast detection of the microrheology of complex fluids, including biological structures. Popescu’s background includes degrees in Physics from the University of Bucharest in his native country and a PhD in Optics in 2002 from CREOL, the University of Central Florida. He worked as a postdoctoral research associate at MIT before coming to the University of Illinois and Beckman in 2007. Popescu’s approach combines his thesis work on light scattering, and his postdoctoral research involving imaging. He says applying optical methods toward understanding tissue dynamics and structure offers several advantages over other techniques. Popescu said their methods are expanding measurement capabilities by getting additional information on both structure and dynamics at the nanoscale. “In our case we push that further in terms of sensitivity, adding interferometry,” he added. “In other words, we are using two beams instead of just one--one that interacts with the sample and the second that is kept as a reference. By comparing these two beams we actually get to the nanoscale structure and motion in live cells and tissue. For those interested in this line of research, Popescu will be teaching a new ECE course on Modern Light Microscopy in which current, cutting-edge topics in microscopy will be introduced. Popescu and his lab members say that their leading-edge research makes coming to the lab a fun experience. “I think that is the most important part, the fact that we talk to one another basically every day, and the new surprising things that keep happening,” Popescu said. “We come to work every morning and we don’t know what we are going to discover. So we talk to one another, go back and forth; I think that is the greatest part of the whole thing.